A Foodie Bibliophile in Wanderlust: Don't try this at home folks; I'm a trained professional? Don't try this at home folks; I'm a trained professional? 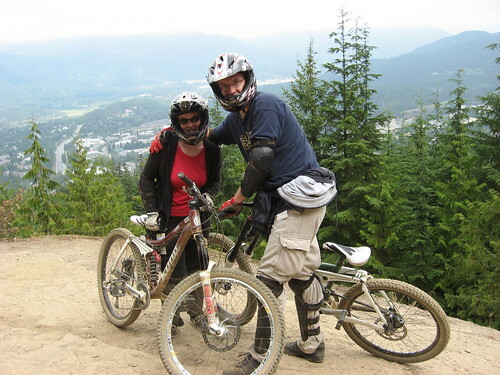 As we were planning our trip, my husband Johnathon and I were reading about Whistler's recent surge in popularity in mountain biking and how it might even become more popular than skiing in the next five years or so. 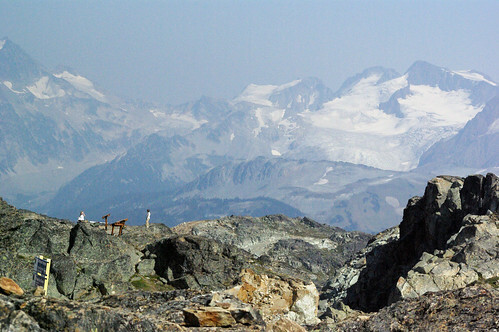 Given that information, Johnathon couldn't resist the idea of mountain biking in Whistler before it becomes "all the rage." I was a bit tentative and skeptical, but I decided I would indulge my husband since I'm generally the one who chooses all the activities we do on vacation. 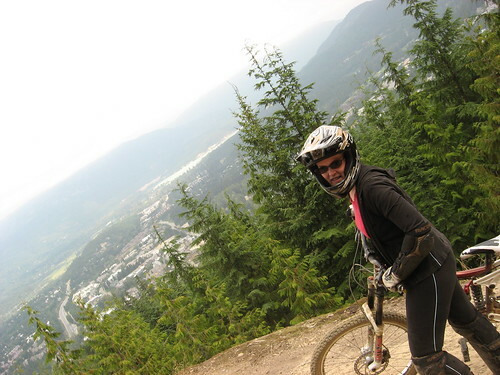 In the summer, the ski runs transform into mountain bike trails and they call it Whistler Mountain Bike Park. The chairlifts are retrofitted so that you can put your bike on the lift previous to the one you get on to go up the mountain. The night before our excursion we went to the bike park office and asked one of the guys there what he'd recommend for two people who'd never biked on anything other than pavement. He suggested a package that came with rentals, an all-day lift ticket and a guide for three hours. So the next morning we arrived at the bike rental shop at 9-ish and began to acquire our gear that we'd be needing for our outing: helmet, gloves, elbow/knee pads, bike. 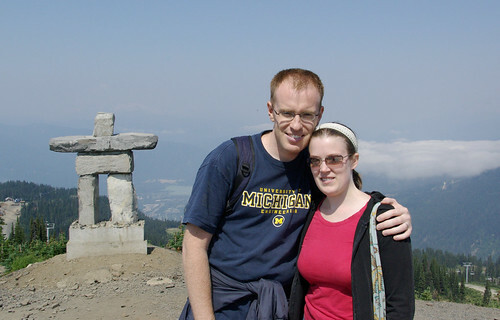 Then we made our way to the meeting area where we were introduced to our guide, Paul from the Netherlands (no one who works in Whistler seems to be from Canada), and three other people on our "tour." After he showed us how to put our bikes on the chairlift (which was itself an undertaking) and we made our way up to the skills center, Paul started us showing us the basics of downhill mountain biking. Thankfully he gave us this "Mountain Biking 101" course before we started on the trails because the one thing I couldn't believe was how powerful the brakes were on this bike. I mean man alive! If you gripped these things with your entire hand you'd be sure to go flying off the front of your bike. Downhill mountain bikes have some serious brakes and shocks. This bike was definitely in a whole other league than the mountain bike I bought on clearance at Target for $20. Which is why Paul told us that you should only have one finger on the brakes at all times. Well the one-finger-on-brake procedure is what turned out to be my demise. I have very small hands; so small that no one I have ever met has ever been able to put my wedding ring on their pinky let alone their ring finger. So trying to reach one finger on the brake at all times (and I had my finger pressed down on the rear brake the ENTIRE time!) was extremely taxing on my wrists and hands. Not to mention the fact that the easy trails that we took could've been considered intermediate in places because they hadn't been groomed in a while. The area's lack of rain had made it near impossible to pack in all of the potholes with dirt because the dry dirt just flies away. So I was taking easy trails that scared the willies out of me towards the end of them because they were so full of unavoidable ruts and potholes. 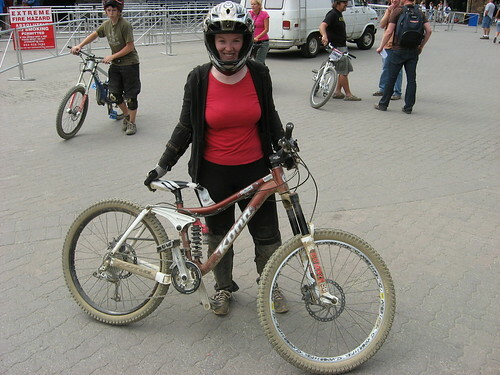 Another aspect of downhill biking I found extremely difficult was that standing up is supposedly easier than sitting down. I actually didn't quite find this true, and I especially found it difficult to keep the pedals level to avoid getting snagged on the ground. Johnathon and I were the slowpokes of our group. I honestly think he would've gone faster had it not been for me, but we always seemed to lag quite a bit behind the other three people in our group. I didn't care though. I wanted to return to our hotel that night with all of my digits and extremities in tact. So I was extremely proud of myself when we ended the morning and I hadn't fallen off my bike once. About two hours into our "three hour tour" our guide decided we were ready for an intermediate trail and by this time my hands were ready to fall off my arms. Which is why I was jumping for joy when about midway through our intermediate trail trek, one of the guys in our group ended up with a broken rear brake and we had to go back to the bike shop to trade bikes. It was 12:30 at this point and there was only a half hour left of our time with our guide. I was tired, hungry and in pain, so when we got down to the base of the mountain where the bike shop was, we shook Paul's hand and said, "We're tired and hungry so we're just going to give the bikes back and go get lunch." At this point in the day I was starting to deteriorate fast. 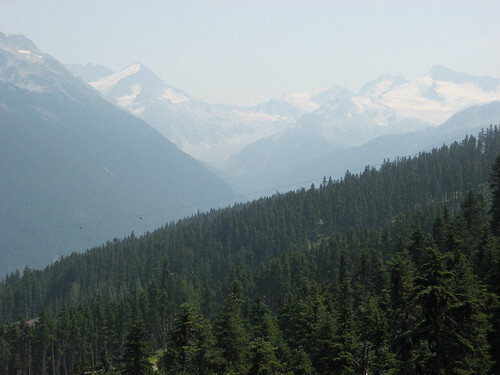 As we descended Whistler Peak to make our way back to the village, I sat in the chilly open air of the chair lift and I started crying from the pain in my wrists and fingers. When we got off the chairlift we had to hike 10 minutes uphill to the gondola station that takes you back to the village, which to me, in my heightened state of pain, was like attempting to climb Mt. Everest. When we finally arrived back to the hotel, I made a beeline for the spa to see if they could recommend any treatment for the agony I was in. I really just wanted their advice as to what I should do or if any sort of treatment would just make it worse. The lady at the front desk was really helpful and she offered to bring out one of their sports therapists so I could ask for her advice. When the therapist came out she said that she would just recommend icing it because the tendons were inflamed and getting a massage might make it worse. This was absolutely the right thing to do because as I started walking back to our room I noticed that any sort of pressure I put on my fingers, hands, or wrists sent burning, aching pain down my arm. I probably would've writhed in agony and wasted a lot of money if I had a therapist put all that pressure on my arms and wrists to give me a massage. So lesson learned: downhill mountain biking is not for those with small, child-like hands. Thankfully as the evening wore on, the pain subsided. I think it peaked at around 5PM and started to fall after that. By the next day I only had a little residual pain to contend with, though it was more muscle twitches than pain. A few days ago I emailed our trip pictures to friends and family and when I talked to my dad on the phone earlier today he said to me, "Well I'm proud of you. I can't believe this is the same girl who, when she was ten, went hiking at the Atwood Lodge and 15 minutes into it had already given up. Now you're rafting and hiking and mountain biking." Well thanks for the vote of confidence Dad, but with regards to mountain biking, I think you'd have to agree that there's still a trace of that ten year old girl still alive and kicking. While I'm proud of myself for attempting such a difficult feat in the first place, pavement, not dirt, is still my preferred method of transportation and ambulation.